Chelsea’s forthcoming fixture with Manchester City will see the British media descend on SW6 for the latest instalment in a drama that has kept the nations tabloid gossip columnists in a state of permanent erection since the story first broke about Blues skipper John Terry’s indiscretions with the ex-girlfriend of former teammate Wayne Bridge. For his apparent sins, JT has been pilloried by the curtain-twitching, goody-two-shoes of polite society, heckled by opposing fans and stripped of the England captaincy … risible actions which have only served to further unify the vast majority of Blues fans in their vocal support of both player and Club. With the injury to Ashley Cole ironically giving Wayne Bridge the opportunity to reassert his claim to the England left-back berth, it’s clear that if differences do exist between Terry and Bridge they need to be resolved swiftly … imagine having our World Cup hopes dashed by a defence that wasn’t on speaking terms. Of course it’s pure conjecture that Terry and Bridge have a problem with each other, but one things for certain, in the build up to Saturday’s match between the Blues and the Citizens, sadly the football will be taking a back seat. Speaking as a genuine Chelsea supporter, I was hugely disappointed when Blues cult hero Wayne Bridge was sold to Manchester City for a fee reported to be in the region of £10million. Cynics suggested that £10million was shrewd business for a reserve team player, whilst Chelsea’s critics argued that the scandalous under-utilisation of Bridge since he’d returned to full fitness following serious injury was symptomatic of the problems that can be created when fashioning a squad with a bottomless pit of money. Ashley Cole is without doubt the finest left-back on the planet, but Wayne Bridge enjoyed a rich-velvety rapport with Blues supporters in much the same way that Joe Cole does now. I’d hoped beyond hope that a solution could have been found to keep Bridge playing regularly at Chelsea, but sadly none was found … I pray to God the same doesn’t happen to Joe Cole, but that’s another story. When Chelsea and Manchester City take to the field on Saturday, I’ll be cheering the Blues to the rafters but, make no mistake, I’ll also be applauding Wayne Bridge, affording the lad the same respect I always do because, like any returning cult hero, he deserves it. Signed from Southampton in July 2003 for £7million in a deal which incorporated Graeme Le Saux heading south to the Saints, Bridge, then 22, was the third high-profile summer arrival at Stamford Bridge as new owner Roman Abramovich’s Chelski revolution got underway. 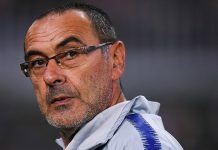 With Claudio Ranieri at the helm, he quickly established himself as Chelsea’s first-choice left back and it was during his first season at the club that he attained ‘cult hero’ status with the Blues faithful. It’s important here to make the distinction between ‘legend’ and ‘cult hero’. Legends are fashioned over time. These are players epitomize the spirit of the Club season in season out. Osgood, Zola and Lampard for example … and yes of course JT. Cult heroes are typically born out of adversity, typically a single flash of genius that turns a game on its head, a moment so glorious it spawns a terrace chant that endures. Dennis Wise scoring in the San Siro, Salomon Kalou crossing the ball in from the left at Anfield and of course Wayne Bridge’s 88th minute goal at Highbury in the quarter-finals of the 2003-2004 Champions League competition. Having drawn the first leg 1-1 at Stamford Bridge, Arsenal were the firm favourites to progress to the semifinals. Genial Blues manager, Claudio Ranieri, wilting under the heavy burden of expectation placed on him by Chelsea’s new owner, had already pronounced himself a ‘dead man walking’ and the expected defeat at Highbury could well have been the final nail in his coffin. In true Chelsea fashion, Ranieri, who had earned himself the entertaining sobriquet of ‘Tinkerman’, kept the same line-up for only the third time that season. When Reyes gave the Gunners the lead, the writing was on the wall. But the Blues had other ideas. Lampard’s equalizer gave Chelsea’s fans renewed hope and with the tie seemingly heading towards extra time, something rather special happened. A moment of pure Chelsea theatre. ‘Follow, follow, follow. There were only two minutes to go. It was Wayne Bridge’s goal that sent us out of control and sent the Arsenal out of Euro … two, three, four’. Racing towards the Clock End penalty area, where Chelsea’s supporters were gathered, the indefatigable Bridge played a deft one-two with Eidur Gudjohnsen. Receiving the ball back from the Iceland international, Bridgey hammered the ball past Jens Lehman in the Arsenal goal. Cue pandemonium. With that goal, Wayne Bridge passed into the annals of Chelsea folklore. He might never have played again, but he had already done enough to secure his position as a Blues cult hero. Sadly, things started to go pear-shaped for Wayne Bridge when in February 2005, during an FA Cup tie with Newcastle United at St James Park, he was stretchered off in agony following a challenge with Alan Shearer that would leave the Chelsea man sidelined for eight months. ‘It was quite serious,’ said Bridge, recalling the gravity of the injury. ‘I broke the fibula which isn’t so bad but the ankle almost came away from the leg. I ripped all the ligaments bar one. It was hanging on by one ligament.’ The only consolation for Bridge came in the shape of a Premier League winner’s medal, for which he had all ready qualified by virtue of his fifteen league appearances during the 2004-2005 campaign. Chelsea signed Asier del Horno as cover, and by the time he was fit again, Bridge had been marginalized and he was loaned out to Fulham in January 2006. The arrival of Ashley Cole, his main rival for the England left back position, in the summer of 2006 was to further restrict Bridge’s opportunities until Cole himself was injured. Seizing his chance, Bridge briefly made the left back position his own and it became the widely held opinion of many Chelsea supporters that he was a better player than Ashley Cole. Despite receiving many plaudits for his performances, Ashley Cole’s return to fitness saw manager Jose Mourinho restore the former Arsenal man to left back and Bridge’s Chelsea career was once more in the doldrums. During the 2006-2007 season, further injuries to Cole gave Bridgey the chance to win a brace of cup winners medals. He played in both the 2-1 Carling Cup Final victory over Arsenal at the Millennium Stadium and the 1-0 FA Cup Final defeat of Manchester United at the all-new Wembley. With both Avram Grant and latterly Phil Scolari preferring Ashley Cole at left back, Wayne Bridge’s international ambitions continued to be dented by a lack of regular first team football. When it came, the offer from Manchester City was too good to refuse and, all things being equal, few Blues fans would begrudge Bridgey the chance to further his ambitions at Eastlands. Wayne Bridge played a modest 124 games (plus 17 as sub) in a Chelsea career spanning six seasons. He found the net four times for the Blues. I was amongst the privileged few to see him score ‘that’ goal at Highbury which elevated him to the status of cult hero, but it was his first for the Club which had already endeared me to the man we knew as Bridgey. December 28th 2003 saw Harry Redknapp bring Portsmouth to Stamford Bridge for what promised to be an afternoon of festive fireworks. In the days when travelling supporters used to be housed in the lower section of the East Stand, Wayne Bridge, being a Southampton lad, had been subjected to a vile torrent of prolonged abuse by the visiting Pompey fans. In the 65th minute, with the game still evenly poised at 0-0, Bridge burst down the left flank before cutting inside, controlling Geremi’s pass on his chest, and unleashing a left-foot shot which whistled past Pompey’s Dutch keeper Harald Wapenaar into the far corner of the net. Cupping his hand to his ear Bridgey then celebrated his fine strike by scampering along the East Stand touchline much to the chagrin of the visitors from the south coast. Chelsea went onto to win the match 3-0. Great memories, that’s why, when Saturday comes, I’ll be standing up to show my appreciation of Wayne Bridge and, as for the rest of it … as the fabulous Doris Day once sang, Que sera, sera, whatever will be, will be, the future’s not ours, to see … que sera, sera, what will be, will be.